Preheat oven 425 degrees. Mix the yeast with the lukewarm water until the yeast is dissolved. Let it stand for a couple minutes. Add the salt and vegetable oil/melted margarine. Mix. Add the flour, and mix. Roll out the dough. Put it in the oven for 5 minutes. Take it out and rub margarine over it. Add toppings, and cook for 10-15 more minutes. Add your favorite toppings, like a homemade tomato sauce, mushrooms, peppers, onions, pineapple, olives. Yum! An Inconvenient Truth will be presented LIVE in the University of Akron’s Student Union, Room 312 @ 4pm. Alvidas Jasin was trained by Al Gore and will present the award winning slideshow/documentary for UA students today. Food and beverages will be provided. Heat stored beneath the Earth’s surface holds 50,000 times the energy of all the oil and gas in the world combined. If it could be harnessed, it would be an ideal source of base-load power: Geothermal is cleaner than fossil fuels, and more reliable than alternative sources like tidal, wind, wave and solar. Unlike oil, which is not renewable, geothermal is predictable, renewable, and inexpensive. Unlike a coal plant, which takes a long time to build (and blow the tops off mountains), this geothermal plant was constructed and producing energy at 5 cents per kwh in less than 5 years. What are we waiting for?! 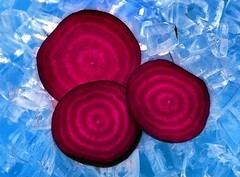 NPR did a story about beet juice de-icer this morning on Morning Edition. They highlighted the benefits beet juice has over calcium chloride (rock salt). Stuff like … better for the environment, safer, longer-lasting, works at colder temperatures, better for roads and cars. It costs more per gallon, but it spreads better and only has to be applied once, rather than 3 times for calcium chloride. It also saves taxpayers’ money on road repair, as it does less damage to roads than the salt. The citizen they interviewed from Akron didn’t seem impressed, because of the immediate cost. I think he must have forgotten the long-term benefits of saving money on road repair. How exciting for Akron to be featured on a national program for reducing our impact on the planet by thinking differently! The Cleveland Plain Dealer also featured a story about the effectiveness of beet juice. According to the article, “the juice blocks ice from forming on pavement even at extremely low temperatures.” Fantastic! I have definitely noticed a difference. The streets aren’t slick when they use beet juice. They’re much less predictable when the temperature is in the 20s or 30s and they use salt. Also, my dog hasn’t had hot spots on her feet this winter. I love that! MDI, a 15-year old French company has invented a car that runs on compressed air. The Air Car will be distributed in the US starting in 2009 or 2010, and will cost approx $17,000. That’s about the same as a small or mid-sized gas car. The car does require a small bit of gas to get the air-engine working, but it will go 95mph with a range of over 900 miles per tank. These new, more energy-efficient cars are smaller, but they take safety seriously. It looks pretty cool too! Today I threw away (correction: recycled) 2 lbs of junk mail that’s been piling up on my counter, since I’ve been sick. (thanks for the well-wishes, everyone!) That’s a lot of junk mail. Now, we can all log onto ProQuo and get rid of pesky junk mail and weekly circulars. Not only does it help the environment, but it can help prevent the pain and irritation of identity theft. I’ve been sick. Still am sick. If you’re sick, stay home. Don’t share with others, please. If your kids are sick, keep them home. See above. I’ll be back soon, with more interesting and relevant news. The majority of Asian elephants are domesticated to work for people. These animals are losing their jobs because the logging industry is declining in some areas of Asia. What happens then? The AEACP seeks to find them other jobs, such as painting, or to improve the education of their handlers, and to provide safe and healthy lodging. 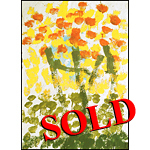 For more information, check out books such as, When Elephants Paint, or Elephants Can Paint Too. 1. Roast the mushrooms. Heat oven to 400 degrees F. Place the olive oil in a large (about 16- by 13-inch) nonstick roasting pan. Add the mushrooms and 1/2 teaspoon each salt and pepper and toss. Roast on the lowest shelf in the oven for 20 minutes. Add the shallots, stir to combine, and continue to cook for 10 more minutes. Remove about 1 1/2 cups of the mushrooms, set aside and keep warm. 2. Make the soup. Remove the roasting pan from the oven and pour in the wine; stir, scraping the browned bits from the bottom of the roasting pan. Add the chicken broth, 2 cups of water, and thyme leaves. Return the pan to the oven and let cook, simmering, for about 20 more minutes. Remove pan from the oven and transfer its contents to a large serving bowl. 3. Finish the soup. Remove 3/4 cup of the mushrooms with a slotted spoon; puree with 1/4 cup of the soup liquid in a blender. Stir the puree, cream, lemon juice, and remaining salt and pepper into the soup. Serve hot, topped with the reserved mushrooms. “Two senior Church of England Bishops have called on people to give up carbon rather than chocolate for Lent,” according to the Telegraph of London. Christians usually give up chocolate or sweets. These bishops are encouraging people to reduce their energy use, and see how easy it is to live carbon-less. Another great suggestion by the bishops is to remove one lightbulb from their home, and live without it for 40 days. Perhaps on Easter, they can replace it with a CFL. Replacing just one regular bulb with a CFL saves 60lbs of carbon per year. I brought this back to the top because I think it’s a great idea. What light could you give up? Owens Community College in Toledo is offering a “photovoltaic principles and application training program” in the spring of 2008. It’s a 5-day program for people interested in installing and integrating photovoltaic panels with “utility-based or off the grid power systems.” The class covers basic electricity, PV systems, and PV theory. This is exciting for anyone who wants to get a jump on the new service-based industry that will be in high demand very soon. Owens Community College students installed solar panels for OCC in 2005. It’s great to see colleges get on board with saving energy, and providing a real competitive edge for their students by demonstrating renewable energy.